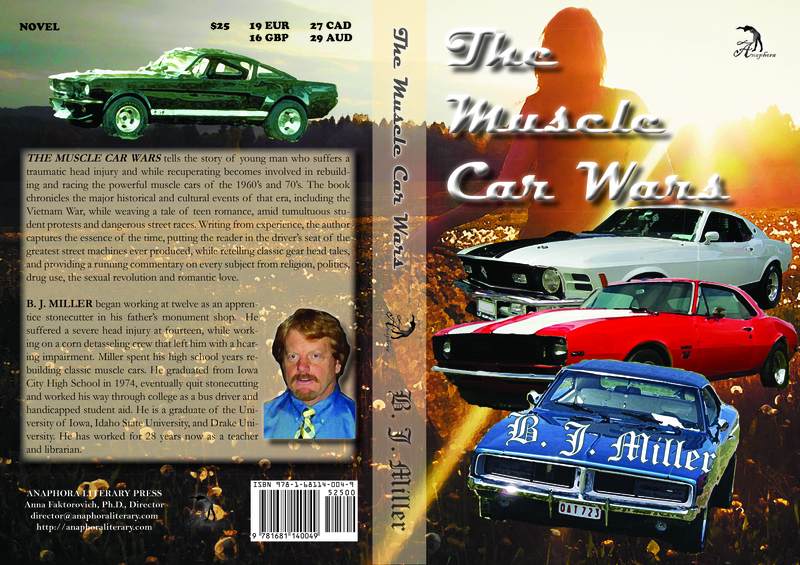 The Muscle Car Wars: ($25, 396pp, 6X9″, Softcover ISBN: 978-1-68114-004-9, Hardcover ISBN: 978-1-68114-110-7, LCCN: 2014922634, January 2015; Purchase on Amazon or Barnes and Noble): tells the story of young man who suffers a traumatic head injury and while recuperating becomes involved in rebuilding and racing the powerful muscle cars of the 1960’s and 70’s. The book chronicles the major historical and cultural events of that era, including the Vietnam War, while weaving a tale of teen romance, amid tumultuous student protests and dangerous street races. Writing from experience, the author captures the essence of the time, putting the reader in the driver’s seat of the greatest street machines ever produced, while retelling classic gear head tales, and providing a running commentary on every subject from religion, politics, drug use, the sexual revolution and romantic love. B. J. Miller began working at twelve as an apprentice stonecutter in his father’s monument shop. He suffered a severe head injury at fourteen, while working on a corn detasseling crew that left him with a hearing impairment. Miller spent his high school years rebuilding classic muscle cars. He graduated from Iowa City High School in 1974, eventually quit stonecutting and worked his way through college as a bus driver and handicapped student aid. He is a graduate of the University of Iowa, Idaho State University, and Drake University. He has worked for 28 years now as a teacher and librarian.